REST APIs are the backbone of modern web development. Most web applications these days are developed as single-page applications on the frontend, connected to backend APIs written in various languages. There are many great frameworks that can help you build REST APIs quickly. Laravel/Lumen and Symfony’s API platform are the most often used examples in the PHP ecosystem. They provide great tools to process requests and generate JSON responses with the correct HTTP status codes. They also make it easy to handle common issues like authentication/authorization, request validation, data transformation, pagination, filters, rate throttling, complex endpoints with sub-resources, and API documentation. You certainly don’t need a complex framework to build a simple but secure API though. In this article, I’ll show you how to build a simple REST API in PHP from scratch. We’ll make the API secure by using Okta as our authorization provider and implementing the Client Credentials Flow. Okta is an API service that allows you to create, edit, and securely store user accounts and user account data, and connect them with one or more applications. 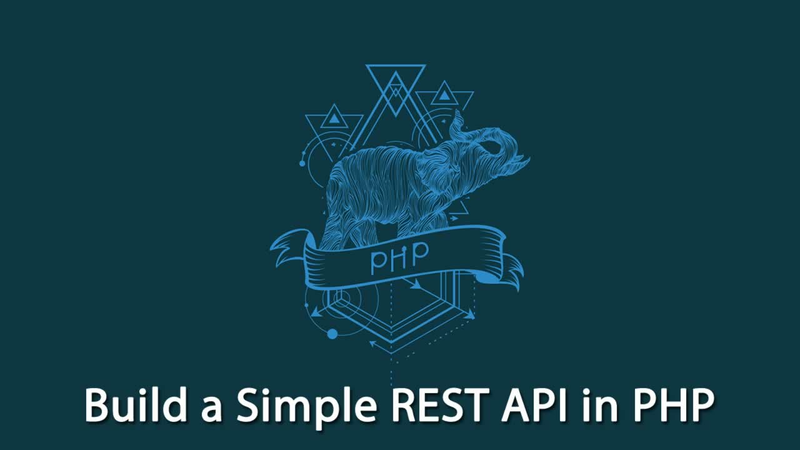 Register for a forever-free developer account, and when you’re done, come back to learn more about building a simple REST API in PHP. There are different authentication flows in OAuth 2.0, depending on if the client application is public or private and if there is a user involved or the communication is machine-to-machine only. The Client Credentials Flow is best suited for machine-to-machine communication where the client application is private (and can be trusted to hold a secret). At the end of the post, I’ll show you how to build a test client application as well. We’ve also configured a PSR-4 autoloader which will automatically look for PHP classes in the /src directory. We now have a /vendor directory, and the DotEnv dependency is installed (we can also use our autoloader to load our classes from /src with no include() calls). and a .env file where we’ll fill in our actual details from our Okta account later (it will be ignored by Git so it won’t end up in our repository). We’ll need a bootstrap.php file which loads our environment variables (later it will also do some additional bootstrapping for our project). Our database is all set! If you want to reset it, just drop the person table in MySQL and then run php dbseed.php (I didn’t add the drop statement to the seeder as a precaution against running it by mistake). There are many patterns for working with databases in an object-oriented context, ranging from simple execution of direct SQL statements when needed (in a procedural way) to complex ORM systems (two of the most popular ORM choices in PHP are Eloquent and Doctrine). For our simple API, it makes sense to use a simple pattern as well so we’ll go with a Table Gateway. We’ll even skip creating a Person class (as the classical pattern would require) and just go with the PersonGateway class. We’ll implement methods to return all records, return a specific person and add/update/delete a person. Obviously, in a production system, you would want to handle the exceptions more gracefully instead of just exiting with an error message. We’ll create a /public/index.php file to serve as our front controller and process the requests, and a src/Controller/PersonController.php to handle the API endpoints (called from the front controller after validating the URI). Then connect to 127.0.0.1:8000 with Postman and send http requests. Note: when making PUT and POST requests, make sure to set the Body type to raw, then paste the payload in JSON format and set the content type to JSON (application/json). We’ll use Okta as our authorization server and we’ll implement the Client Credentials Flow. The flow is recommended for machine-to-machine authentication when the client is private and works like this: The client application holds a Client ID and a Secret; The client passes these credentials to Okta and obtains an access token; The client sends the access token to the REST API server; The server asks Okta for some metadata that allows it to verify tokens and validates the token (alternatively, it can just ask Okta to verify the token); The server then provides the API resource if the token is valid, or responds with a 401 Unauthorized status code if the token is missing, expired or invalid. Before you proceed, you need to log into your Okta account (or create a new one for free), create your authorization server and set up your client application. You can see the Issuer URI of my test Okta account in the screenshot above. Copy your own value and put it in your .env file. In this section, we will add a simple client application (a command line script using curl) to test the REST API. We’ll create a new php file ‘public/clients.php’ with a very simple flow: it will retrieve the Okta details (issuer, scope, client id and secret) from the .env file, then it will obtain an access token from Okta and it will run API calls to get all users and get a specific user (passing the Okta access token in the Authorization header).